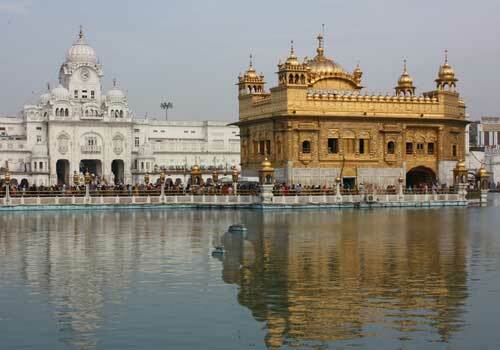 Amritsar is one of the most beautiful and popular spiritual travel destinations in Punjab, India. Amritsar is a major spiritual center for the Sikh religion in India and is one of the most visited spiritual travel destination in India. The city of Amritsar is famous for the Golden Temple (Harmandir Sahib) which is one of the most important Gurudwaras for the Sikh religion. The Golden Temple is marked for its amazing beauty and is surrounded by water which makes it more attractive. Amritsar literally means “Holy Pool of Nectar” and derived this name mainly due to the presence of the water body surrounding the Golden Temple. The Golden Temple is a highly sacred shrine for the Sikhs and people from across the globe visit this holy place on a regular basis. The Golden Temple in Amritsar is noted for its amazing architecture and becomes more beautiful during the night when the temple along with its beautiful golden dome become fully illuminated. As per reliable sources, the number of people visiting Golden Temple in Amritsar is on par with the number of people visiting Taj Mahal in Agra. Since Amritsar is mainly a spiritual destination, a lot of tourists are attracted towards this city during various festivals. The festivals in Amritsar add more charm to the beauty of the city and people from different parts of the world visit this city during the festival seasons. Some of the major festivals and fairs that are worth attending in Amritsar include Diwali, Holi, Lohri, Vaisakhi, Guru Nanak Jayanti and Ram Tirath Fair. These festivals are celebrated in a unique way and it is highly recommended to visit Amrtisar during the festive seasons to get a better taste of its cultural celebrations. Apart from spiritual destinations, Amritsar also has some other things in store for the travelers and one of such travel destination for you to visit in Amritsar is the Jallianwala Bagh which is a historical site of the 1919 Amritsar massacre. The Jallianwala Bagh is at a walking distance from the Golden Temple and you will be able to get a feel of the horrible massacre with the remaining evidences of holes created by the bullets. Another major travel attraction in Amritsar is the Summer Palace of Maharaja Ranjit Singh which is located in the Ram Bagh Park. This amazing ancient palace in Amritsar consists of a museum, oil paintings, miniatures, coins and weapons that were used by the Sikhs. Apart from this palace, there is also the Mata Temple and Ram Thirth which are also considered as a major travel attraction in Amritsar. Amritsar experiences an extreme climatic conditions and hence it is better to avoid visiting this place during peak summer and winter seasons. The best time to visit Amritsar is from October to November and from February to March. Amritsar is well connected to the other major cities by air, rail and road which make it easier to reach this holy pilgrimage travel destination. A number of hotels and lodges are available in and around Amritsar which makes it easier for the travelers and pilgrims to get a suitable accommodation while on their trip to Amritsar. You can also take the help of various specialized tour operator to make your trip to Amritsar smoother. You can also compare quotes from different travel agents online and go with the one that you are satisfied with. This entry was posted in Amritsar and tagged amritsar golden temple, amritsar punjab travel, amritsar travel, golden temple tour. Bookmark the permalink.